Cheeses were forced to ‘listen’ to a variety of different songs on loop. A momentous study released its results yesterday and the conclusion was; music really can alter the flavour of cheese. Last September, Swiss cheesemaker Beat Wampfler and a team of researchers from the Bern University of Arts placed nine 10kg wheels of Emmental cheese in individual wooden crates in Wampfler’s cheese cellar. Then, for the next six months, each cheese was exposed to an endless, 24-hour loop of one song using a mini-transducer, which directed the soundwaves directly into the cheese wheels. The cheeses were forced to “listen” to music as diverse as Mozart’s The Magic Flute, Led Zeppelin’s Stairway to Heaven, Yello’s Monolith, A Tribe Called Quest’s Jazz (We’ve Got), and Vril’s UV. The project, titled: “Sonic cheese: experience between sound and gastronomy”, hoped to show that the power of music could influence the development, characteristics, and even flavour of the cheese for reasons possibly only known to the researchers. 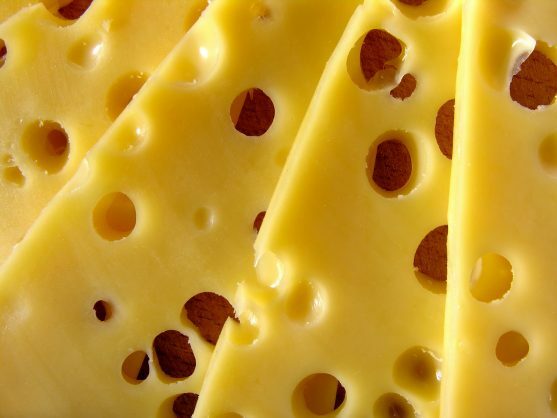 After the six months were up, the cheese was then examined by food technologists from the ZHAW Food Perception Research Group, which concluded that the cheese exposed to classical music had a milder flavour compared to the non-musical cheese and that the hip-hop cheese had a stronger aroma and stronger flavour than other samples. Then the cheeses were sampled by a jury of culinary experts during two rounds of a blind taste test. The results were similar to the research group’s conclusions with the Tribe Called Quest cheese coming out on top.